Today we are releasing our first Report Card on the electronics retailers and their programs (or lack thereof) to help us recycle our old electronics. Staples, Best Buy, and Office Depot got the highest marks, as all three have robust programs that let consumers bring our items back to their stores for recycling. But we gave F’s to nine of the 16 retailers we reviewed for having no real program. This includes retail giants like Walmart, Sams Club, Amazon, and Costco. Another four, including Target and Radio Shack, got Ds for having limited programs. Office Max was somewhere in the middle, mostly requiring people to mail products back, but notably taking printers and laptops back at their stores for recycling. It’s time for these retailers to step up and start taking some responsibility for their role in the e-waste problem. They are selling us billions of dollars in electronics, but most are doing nothing to help us recycle them. Walmart sold over $20 billion in electronics in the U.S. in 2012. They have 3742 stores, in all 50 states. Millions of people are buying their electronics there. Imagine if these were also recycling collection centers, that would be a big boost to the current e-waste collection infrastructure, especially in states with no e-waste recycling law. Many of the retailers, including Walmart, tout their trade in programs, where you can mail back used items and get store credit. But the first problem is that they only take the small stuff that they can make money from (phones, tablets, cameras, etc.) and they don’t take the low value stuff that people really need help recycling – TVs, monitors, printers, VCRs, DVD players and other stuff you plug into your TV. And second, these are mail back programs. Most people won’t mail back anything but the very smallest stuff like phones. So it’s not surprising that these companies won’t disclose the volumes coming back from their mail-back trade in programs. It can’t be much. 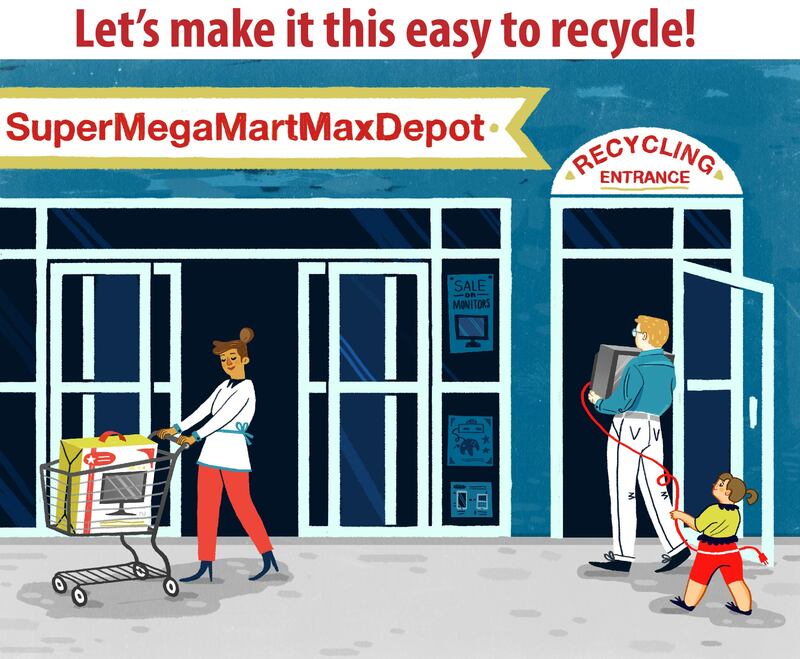 Retailers need to do what Best Buy, Staples, and Office Depot have done, and use their stores as e-waste collection centers. It should be just as easy for us to recycle our old stuff as it is to buy the new stuff. The EPA released new figures recently that show that our recycling rates have increased, but we are still only recycling about 25% of the electronics that people are getting rid of. The rest is still going into the trash. The retailers are in an excellent position to help here, since that’s where we are buying most of these products. We’d like to see the retailers partner with some of the manufacturers, particularly the TV companies, who always struggle to create collection opportunities for their recycling programs. But we don’t just want to focus on the brick and mortar retailers. The online guys also need to step up. Amazon is the number #3 electronics retailer, selling $19 billion in electronics last year. True, it’s a more difficult proposition for them, since they don’t have stores. But Amazon has figured out how to set up a whole network of locker delivery locations, by partnering with various other retailers, including Staples, Rite Aid, Ace Hardware, and Seven Eleven. They could do the same kind of partnering to help their customers recycle their old electronics. As consumers, we should give our business to the retailers who are doing the right thing, and helping us recycle. Why should we support the laggards, who are sitting on the sidelines and letting Best Buy, Staples, and Office Depot do all the work?